and Celebration for The 2010 New Fellows. IEEE Tokyo Section will host The 2010 Annual General Assembly, The 2010 First Commemorative Lecture and Celebration for The 2010 New Fellows. 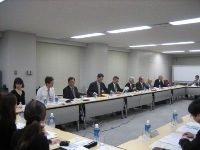 The 2009 Third Meeting of Japan Council Long Range Strategy Committee (LRSC) was held at IVY HALL from 3:00p.m on Monday, November 9. The minutes of the second LRSC was anonymously approved. Following the last meeting, LRSC discussed how to encourage potential volunteers to be involved regional activities such as R10 as well as IEEE Societies. Three possible ideas were on the table. For the coming R10 director nomination, JC secretary will remind all section chairs in JC if they are aware of next R10 director nomination and report its status to the coming Japan Council ExCom. This may help encouraging nomination. For the long term activities, LRSC will list up potential volunteers in technical fields. The first version of list will be prepared by Matsui, Chair, LRSC, and will be reviewed in due course. The second agenda was to exchange information and view with IEICE regarding long range issue of academic societies in Japan. Prof. Katsumi Emura, Chair, a working group in IEICE which studies long term issue of IEICE, presented IEICE's situation and associated issues. Main issue in IEICE is decline of memberships from industries. LRSC members pointed out that the issue is not just for IEICE, but it is a case for IEEE in Japan as well. So, there must be ways to increase mutual benefits between IEEE and IEICE as we share the same issue in Japan. 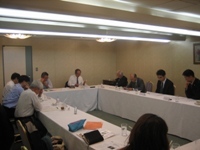 The 2009 First Meeting of Japan Council Award Committee (AC) was held at FLORACION AOYAMA from 3:00p.m on Thursday, December 3. Addresses were given by Dr. Suemastu, Chair, Awards Committee, and Dr. Aoki, Secretary, Awards Committee, to share what is the scope of the committee, and also purpose of the committee. The committee reviewed a list of IEEE Medals & Awards, recipients of these awards from Japan, as well as elevated members to fellow from Japan. It is realized that there is a trend that number of recipients is decreasing with time. Then, members of the committee introduced their own experiences each other, such as process to find candidates and nominators. As a conclusion, the committee decided to try to make a list of awards for JC members in Japanese so that JC members be aware of IEEE awards and to provide useful information for the nomination process to help the potential niminators. The committee will continue to work over emails for the coming year. 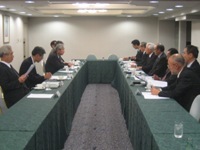 The 2009 Third Meeting of Japan Council Executive Committee was held on Monday, December 14, from 3:00 p.m. at Marunouchi Center Building, Tokyo.